What are your most vivid childhood summer memories? My most vivid memories include swimming, spending time with my mom and brother on lazy days, tennis and art classes with my BFF (yes it’s the same “best friend forever” since I was 6 that lives across the street from me today), trips to Japan, and somen. 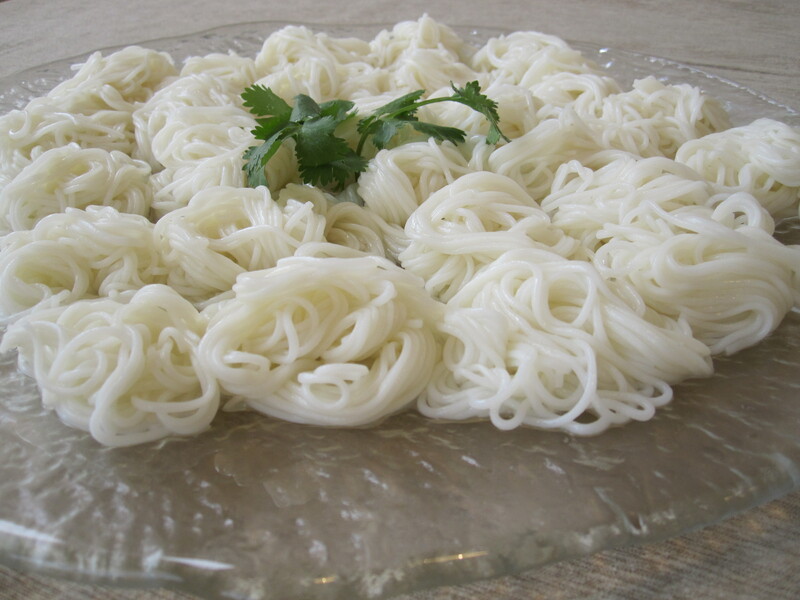 Somen is a very thin, white noodle made of wheat flour, and is typically served cold with a dipping sauce. As a child, my most favorite summertime food was Japanese somen noodles. On hot summer days, my mom made somen for us quite often because it’s refreshing, cool and the perfect light meal when our appetites were stifled by the heat. My mom took this simple dish of cold noodles one step further and served somen with an assortment of garnishes. Usually these included cucumber, tomatoes, shiso (perilla), negi (green onions), sliced tamagoyaki (egg) and myoga ginger. On game day Thursday, I invited my BFF and our girlfriend L to have lunch at our home. Since the weather has been warmer, I thought somen would be perfect. :) I served this with a platter of garnishes, a light salad and baked chicken kara-age. For dessert, my BFF brought an assortment of beautiful cakes from 85 Degrees Bakery. Needless to say, we had a fabulous lunch! Garnishes from bottom left to right: negi, simmered shitake, tamagoyaki, tomatoes, cucumber, and shiso. Kizami nori (seaweed) is also a great garnish for somen. Thursday was also special because that night, big onechan received multiple awards recognizing her outstanding academic achievements in school this year. Originally, we all planned to attend her awards ceremony together, but because bebe E hasn’t been herself the past few days we decided I would stay home with her. Bebe E is teething and she managed to “grow” her 3rd and 4th teeth this week as both broke through her gums! Unfortunately, she’s experiencing a significant amount of discomfort, resulting in lots of tears, whining and constantly wanting to be held. So we stayed home, bebe E went to bed early and big onechan came home with six awards… six! :) We are all so very proud of her! Another accolade I would like to mention, although it certainly pales in comparison to big onechan’s achievements, is that earlier this week, Jean of Lemons & Anchovies nominated me for my second blog award, yet another Sunshine Award! I’m very honored to be recognized by such a talented food blogger. Jean is an exceptional writer and her recipes are superb. Please take a moment to visit her blog when you have the chance. A lot happened on game day Thursday… fabulous lunch with girlfriends, several accolades for big onechan (one for me too), and last but not least, the Lakers beat the Celtics in Game 1 of the Finals, 102 – 89. Woo-hoo! Our game night dinner was identical to game night lunch, consisting of somen, salad, and chicken karaage – leftovers from lunch. Heh-heh. :) Since I was already cooking lunch I just made extra for dinner. (Why cook twice, right!?! ) Although bebe E and I were at home for the game, I only watched some of the 1st quarter until bebe dada and big onechan left for the awards ceremony and then some of the 4th quarter after bebe E fell asleep. If you’re wondering where I was during the 2nd quarter, half-time, and the 3rd quarter, I was spending quality time with bebe E, trying to comfort her, giving her a soothing bath and rocking her to sleep. From what I saw of the game, the Lakers were looking pretty good, if not great, and the Celtics were really stinkin’ things up. 1) Boil somen noodles according to the package, or just do what I do. :) On medium-high heat, boil enough water to cover the noodles, place the somen in the pot, reduce heat to medium and immediately stir the noodles with chopsticks to prevent the noodles from sticking together. Once the water begins to froth and boil, add about 1 – 2 cups cold water to the boiling pot and then allow the water to come to boil again. Remove from heat and drain noodles in a colander and rinse with cold water until the noodles are no longer hot. 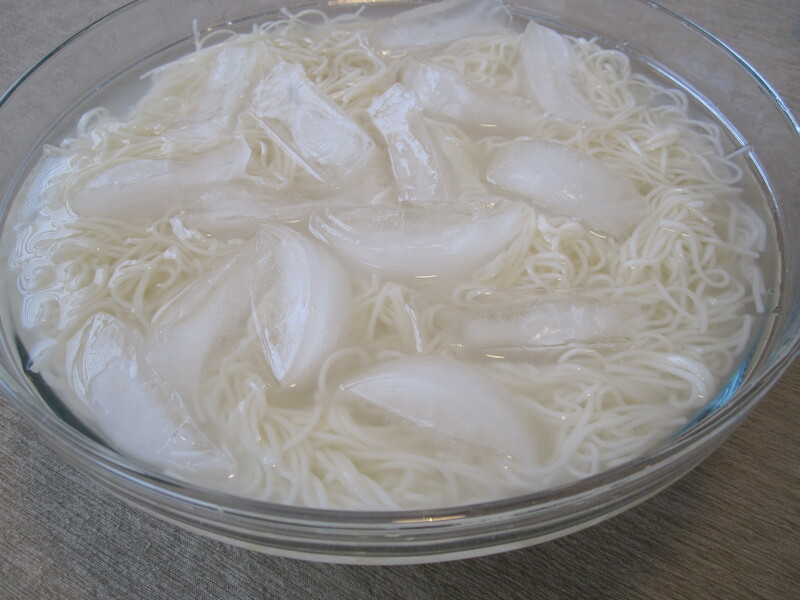 Immediately transfer the noodles to a large bowl, fill with cold water and add several ice cubes to chill. 2) Prepare simmered shiitake according to the recipe found on my chawan mushi post. (One of these days I’ll create a separate post for simmered shiitake.) Let the mushrooms cool, then slice. 4) Slice other ingredients and arrange on a platter. 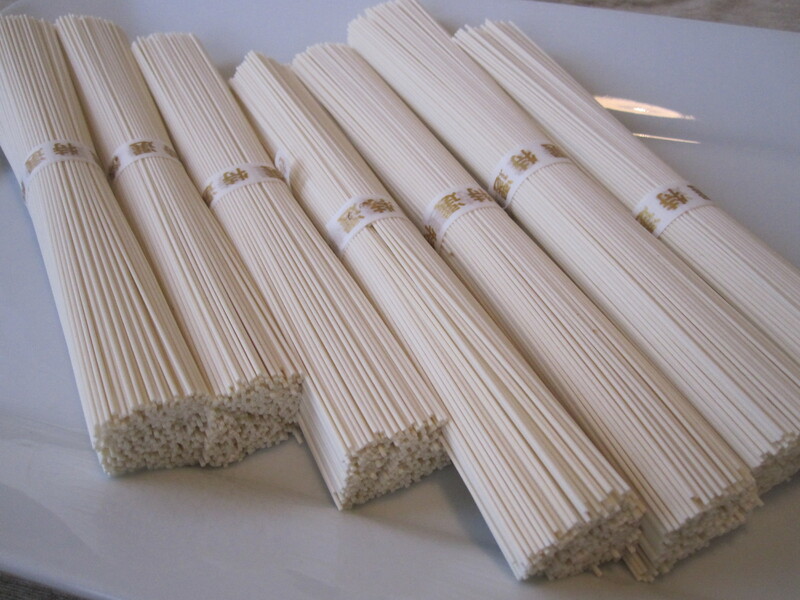 5) On a separate large platter, arrange somen noodles in individual bite-sized portions. My mom serves somen two ways. Sometimes she’ll serve somen in a large bowl with water and ice cubes and we would dip our chopsticks in the bowl to grab the somen. More typical, however, is that my mom arranges little bite-sized mountains of somen on a nice platter because it’s easier to grab and eat the somen this way with chopsticks, and it’s neater – no water dripping all over the table from the “community somen bowl”. To make an individual portion, grab a small handful of somen with your fingers, gently allow the somen noodles to hang suspended while some of the excess water drips off, then gently lay the somen on a platter using a circular motion to create a little mountain of noodles. Repeat until you have enough little somen mountains for everyone to enjoy. Serve immediately while the somen is ice cold. It’s so refreshing when the somen is ice cold! This entry was posted in Bebe E's Favorites, Japanese Cuisine Favorites, Lakers, Pasta & Noodles and tagged Blog Award, Japanese cold noodles, somen, Sunshine Award, thin wheat noodles by Judy | Bebe Love Okazu. Bookmark the permalink. Mmm YUM!! This is perfect for a hot day like today. What a beautiful lunch and made even better since you shared it with your best friend. How lucky for me to have seen your post! I just bough Somen and didn’t really know what to do with them. Now I do :) This looks so good and perfect summer food. Hi , this is great food for hot weather and thanks for sharing the recipe.